The new Versa-Flex MU1732.08 case. 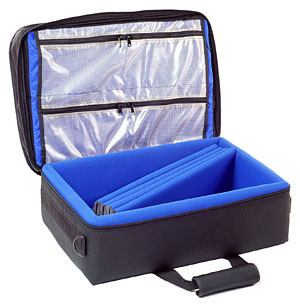 Versa-Flex, Inc. has released there new size case featuring steel reinforced rim, and Fatigue Ease™ handles. The MU1732.08, (MU for Multi-Use), is 8 inches longer than the very popular MU1724.08 used heavily by the sports photographers to carry the 400mm and 600mm lenses together. The MU1732.08 unique design allows photographers the safest way to transport more delicate photographic equipment without the weight of ATA style box. Larry Nolan, president of Versa-Flex, has been making custom and standard photographic cases for sports photographers for over 11 years. Mr. Nolan, who works for NFL Films as a camera loader during the football season for over 18 years, saw the problem with the way the photographic lenses were being handled on the sidelines and quickly came up with MU1724.08. Wheeled versions of his popular cases are in the works. Additional information about Versa-Flex product line can be accessed on the World Wide Web at www.versa-flex.com, or calling Versa-Flex @ 216-631-0666. The early registration deadline for the Atlanta Photojournalism Seminar (held December 6th and 7th) is 11/3/02. You can always register after that or even at the door, but early registration saves you $15. The contest deadline is 11/19/02. "This is the best photography workshop east of Los Angeles," USA TODAY's Robert Hanashiro said, "If you couldn't make it to the Sports Shooter Workshop, this is the one you can't miss. It has it all." More information, including registration forms and contest rules can be found at www.photojournalism.org. Robert Hanashiro, staff photographer with USA TODAY and founder/publisher of the Sports Shooter Newsletter will be speaking at San Jose State University on Thursday Nov. 7. Hanashiro will be showing an assortment of his work and says "I won't be showing just sports". He adds that he will be presenting a selection of his celebrity portrait work as well as several recent picture stories. "I will have my Winter and Summer Olympic programs and I have a special treat in store for this evening. I will be showing some behind-the-scenes video I shot of photographers working during at the recent World Series," he added. Hanashiro's presentation will be in the SUSU Art Building, room 133. The program will start at 7:30 pm. For information and directions, contact SJSU NPPA chapter advisor Dennis Dunleavy at (408) 924-3245 or dunleavy@jmc.sjsu.edu.